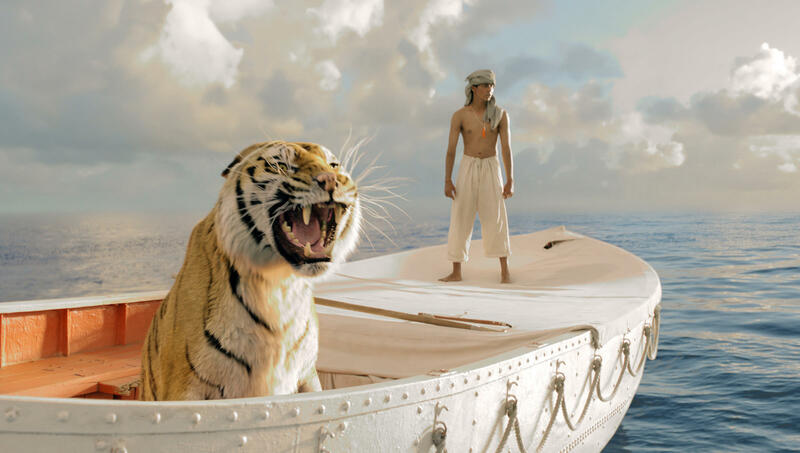 Lost at sea, Pi (Suraj Sharma) Patel begins to make an extraordinary connection with a fearsome Bengal tiger named Richard Parker. Pi Patel (Suraj Sharma) and a fierce Bengal tiger named Richard Parker must rely on each other to survive an epic journey in Life of Pi. Director Ang Lee on the set of Life of Pi. But Lee, whose films include everything from period pieces like Sense and Sensibility to big-budget action films like Hulk and epic romances like Brokeback Mountain, decided that he was up to the challenge. He loved Martel's book and decided to take on every obstacle, one by one, using 3-D technology and special effects, including computer-generated tigers. "I think 3-D is actually great for drama," he tells weekends on All Things Considered host Guy Raz. "It just wasn't recognized that way because it's expensive to do and naturally it goes to action movies, but I've found that it's a valuable tool to tell [a] story." "The good thing about bringing real tigers is — not only that they look real and are cheaper than [computer-generated] tigers — but they left a lot of good references for the animators. When we go about [making] CG tigers, we know exactly how they move down to every hair and muscle. We learned a great deal from the living tigers." "[When] I got hired to do Sense and Sensibility, I was very scared. I had never done [a] period piece, I had never done [an] English job. I had never worked in a so-called major-league production. I had a big learning curve. I spoke pretty not-fluent English back then. If I could do that movie, if I can get over that, anything's possible. That was very encouraging. After that, I was afraid that if I stayed in one place doing [the] same type of movies, I'd be pigeonholed and I would have a very limited career. I was scared that that might happen. So I have to take an adventure to keep myself energetic." "I was exhausted. After that movie and Crouching Tiger, Hidden Dragon, it was five years of my life. I thought of retiring. And Hulk was related to violence and anger. You know, I didn't treat it like an entertaining blockbuster comic-book movie; I treated it like a psycho-drama. So it really took a lot out of me." "He said it's a bad example for your kids so he said, 'Go ahead and make another movie.' For the first time he was encouraging in terms of filmmaking. He passed away shortly after that, and I had to finish that movie Brokeback Mountain. And that's a movie about love, and I really dedicate that movie to him." "I'm not a master of films, I'm rather a slave. When something possesses me, I go ahead and do it. Sometimes I [feel] it's the movies that direct me, not the other way around. So I'm just waiting for the next thing that grabs me." It's WEEKENDS on ALL THINGS CONSIDERED from NPR News. I'm Guy Raz. 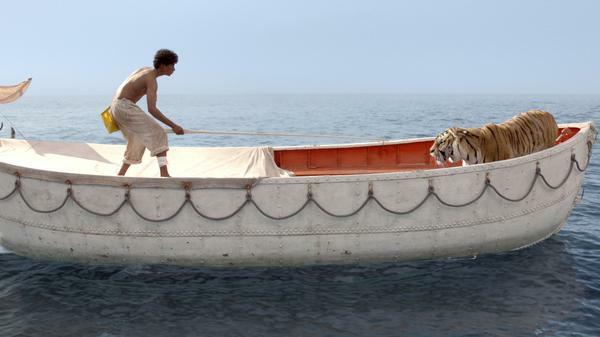 Director Ang Lee's new film "Life of Pi" tells a story of a 16-year-old Indian boy, the lone survivor of a shipwreck who finds himself lost at sea, alone on a boat with a Bengal tiger. SURAJ SHARMA: (as Pi) We were both raised in (unintelligible) the same monster. Now we've been orphaned, left to face our ultimate monster together. RAZ: The film is based on Yann Martel's fantasy novel of the same name. That novel won the Man Booker Prize for fiction and was quickly optioned by Hollywood producers. But many in Hollywood didn't think it could be made. I mean, how do you make a movie set almost entirely on a boat in the middle of the ocean with a real tiger? That was a question Ang Lee asked himself. He loved Martel's book, so even though he knew it would be a challenge, he decided to take it on one step at a time. 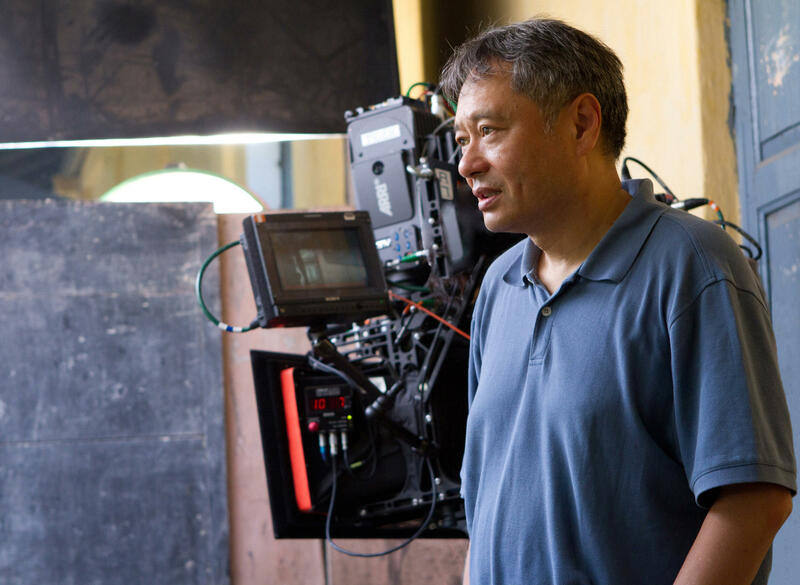 ANG LEE: Technically, how do you do boy and tiger on a boat? And water movie is among the most difficult one, and then adrift without Tom Hanks. RAZ: Yeah. Tom Hanks could not play Pi. LEE: It's not like "Cast Away" with Tom Hanks, established movie stars. Obviously, a 16-year-old Indian boy. And physically, it's pretty hard to pull off too. You know, how do you do the tiger? Digitally, 10 years ago when it came out, it's pretty impossible. RAZ: You mean when the book came out 10 years ago, people--that technology wasn't there yet. LEE: It wasn't there when I start doing this movie. RAZ: Let's talk about the technology, because this is a 3-D movie. I mean, most people think of 3-D movies as blockbusters or Disney movies or, you know, James Cameron-type films. This is a highbrow film in 3-D.
LEE: I think 3-D is actually great for drama. It just wasn't recognized that way because it's expensive to do. And naturally, it goes to action movies. What I found is it's a valuable tool to tell a story. RAZ: What were you able to do in 3-D? What did it bring to the film in your view that you wouldn't get if it was a two-dimensional film? RAZ: Underwater too. There are beautiful shots underwater. LEE: Water and under water. Anything that's moving. When they bring out to your eyes, you feel you exist there. RAZ: The majority of the film takes place in the middle of the Pacific Ocean - a boy and a tiger on a raft. SHARMA: (as Pi) My name is Pi Patel. I have been in a shipwreck. I am on a lifeboat alone with a tiger. RAZ: The tiger's name is Richard Parker, for anybody who's read Yann Mattel's novel. Was that tiger real? I mean, he looked real. LEE: Some of them are real. We had four tigers. We brought four to Taiwan to make this movie. And most of them are CG tigers. Believe me, you cannot tell the difference. RAZ: I mean, you can't tell the difference. That's what's incredible. LEE: The good thing about bringing real tigers, not only they look real and they're cheaper than CG tigers, but they left a lot of good references for the animators when we go about CG tigers. We know exactly how it move down to every hair and muscle. We learn a great deal from the living tigers. RAZ: I'm speaking with the acclaimed director Ang Lee. His new film is an adaptation of the novel "Life of Pi." It's also called "Life of Pi." I'm fascinated by, not just by this film but also by your personal story. And I know you've been on NPR before, and you've talked a little bit about it, but, I mean, it is amazing. You grew up in Taiwan, and you came to film school here. You didn't speak English that well, and you got your BA. And then you went to film school, and you became one of the most successful directors ever in Hollywood. I mean, do you ever think about how unlikely that was going to be? LEE: Well, it happened over, like, 20 years. At times, I felt it's pretty incredible. Most of the time, I just try to make the scenes work, try to overcome obstacles. And somehow, things work out. I don't know. RAZ: It seems like you are always testing your comfort level. I mean, you go back and you look at your career, "Wedding Banquet" and "Eat Drink Man Woman." Those, of course, touch on Chinese culture. But then you go to "Sense and Sensibility," I mean, a classic of English literature, to "The Ice Storm" and "Brokeback Mountain," now, a film that deals almost primarily with Indian culture. How do you do that? LEE: I don't know. I got sucked into those stories. They're so fascinating that I forgot to be afraid of them. I got hired to do "Sense and Sensibility." I was very scared. You know, I never done period piece. I never done English job. I never work in the so-called major league productions. I had a big learning curve. I spoke pretty not real fluent English back then. If I could do that movie, if I can get over that, anything's possible. That was very encouraging. After that, I was afraid that if I stay in one place doing the same type of movies, then I'll be pigeonholed and I will have a very limited career. I was scared that that might happen. So I have to take an adventure to keep myself energetic. RAZ: I read that after you made the "Hulk," which, again, was a huge departure, because it's a blockbuster and it's a cultural touchstone, the huge comic book character, big budget, that you actually thought about retiring as a filmmaker. LEE: Yeah. I was exhausted. After that movie and "Crouching Tiger, Hidden Dragon," it took five years of my life. I thought of retiring. And "Hulk" was related to violence and anger. You know, I didn't treat it like an entertaining blockbuster comic book movie. I treated it like psychodrama, so it really took a lot out of me. RAZ: I read that your--it was your father who actually convinced you not to retire, but this was the same father who urged you to become a professor and not a filmmaker. LEE: Yeah. Well, it's more respectful than entertainer, a filmmaker. It's more acceptable, so to speak. RAZ: I assume that he came around eventually. LEE: Yeah. Retiring is worse than being a professor at age of 49. He said it's a bad example for your kid. He said: Go ahead. Make another movie. That's the first time he was encouraging in terms of filmmaking. He passed away shortly after that, and I had to finish that movie "Brokeback Mountain." And that's a movie about love, and I really dedicate that movie to him. RAZ: ...but can you imagine doing that or veering off in a completely radical direction? Where would that direction be? LEE: I have no idea. I'm so drained and--like right now. LEE: I just try to survive this one, just emotionally, spiritually. I'm not a master of films. I'm rather a slave. When something possesses me, I go ahead and do it. Sometimes I felt it's the movies that direct me not the other way around. So I'm just waiting for the next thing that grabs me. RAZ: That's director Ang Lee. His new film, "Life of Pi," opens in theaters November 21st. Ang Lee, thank you so much. Congratulations on this film. LEE: Thank you. Transcript provided by NPR, Copyright NPR.